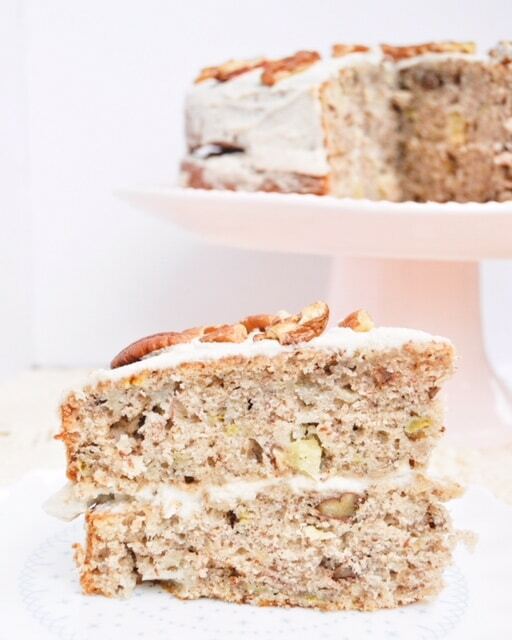 What is vegan hummingbird cake, anyway? Fear not, no birds were harmed in the making of this delicious cake. 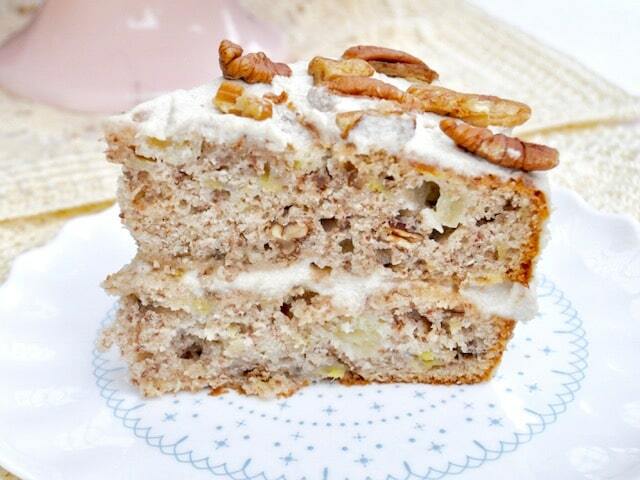 Hummingbird cake is a classic Southern spice cake made with bananas and pineapples. It was originally published in Southern Living in 1978, and since then it’s been a classic Southern dessert staple. 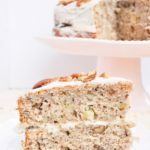 Despite the fact that I grew up in Georgia, I didn’t stumble upon hummingbird cake until recently. I went to the most wonderful vegan diner in Eugene, Oregon called Cornbread Cafe and saw a slice of cake sitting in their dessert display. I actually got so stuffed on my southern style tofu sandwich that I didn’t have room for that lovely slice of cake. So… you know. I drove home from Eugene and started making vegan hummingbird cake at 9pm at night. Because why not? It’s so quick and easy to make. And I had a brunch the next morning that I hadn’t prepared anything for, so… hummingbird cake at 9pm on a Saturday night it was! How do you make cashew cream cheese frosting? Maybe this is an unpopular opinion, but sometimes I am just overwhelmed by the sweetness of frosting on a cake! So here’s where I deviate a bit from the original recipe. 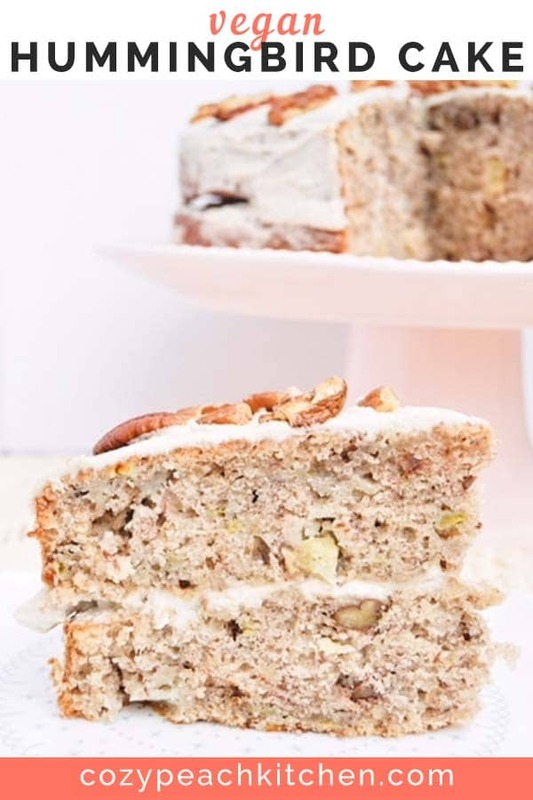 Cashew cream cheese frosting is a healthier, lighter alternative to the classic cream cheese frosting that usually comes with a hummingbird cake. Sugar is not the main ingredient in this frosting, so you can make it as sweet (or unsweet) as you want. 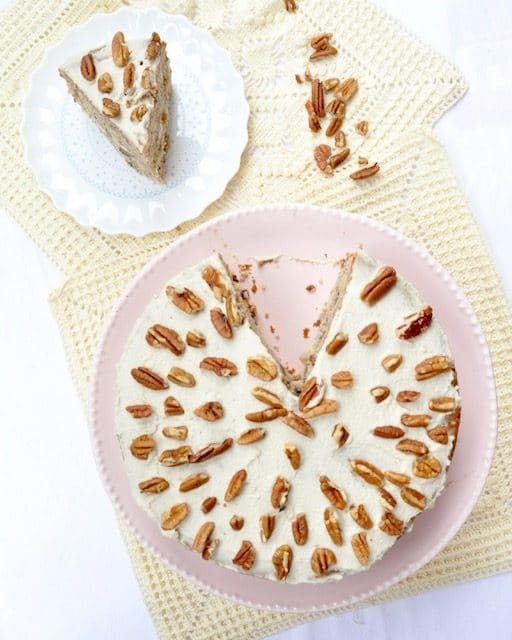 The cashews are a great complement to the flavor of the pecans, and they create a wonderfully smooth and spreadable frosting. All you have to do is add sweetener, cashews, and a bit of non-dairy milk to a food processor. Process until smooth, then ice the vegan hummingbird cake! Ok – it’s cake baking time! 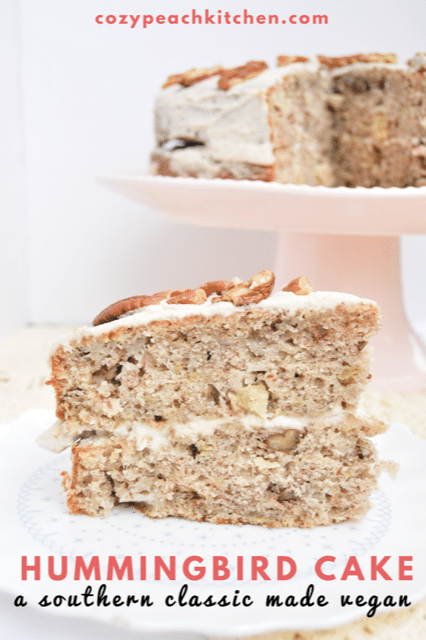 This vegan twist on the classic southern hummingbird cake is the perfect cake for any occasion. This recipe is adapted from Southern Living. Preheat oven to 350°F. When oven is preheated, toast chopped pecans on a cookie sheet for 8 minutes. Prepare flax eggs by mixing together ground flax and water. Let set for at least five minutes before using. Whisk together dry ingredients in a large bowl: flour, sugar, baking soda, salt, cinnamon, nutmeg, allspice. Add flax eggs and oil, just until dry ingredients are moist. Pour in pineapple tidbits with juice, mashed banana, and vanilla. Stir until just combined. Grease two 9" cake pans with cooking spray or vegetable oil. Divide batter evenly between the two pans. Bake in preheated oven for 30-35 minutes, or until toothpick inserted in the center comes out clean. Cool in cake pans on wire racks for 10 minutes, then turn out of pans and let cool for one hour. Soak cashews overnight, or for at least 6 hours (this allows them to soften.) Blend cashews in a food processor or high powered blender until smooth. Blending time will varying depending on the strength of your food processor. The blended cashews will form a thick paste. Pour in non-dairy milk, one teaspoon at a time, until a thin, spreadable consistency is reached. Stir in vanilla. Add in agave syrup to taste. Spread evenly on both cake layers.